Baby Brayden Signing - Thank you for my birthday present! 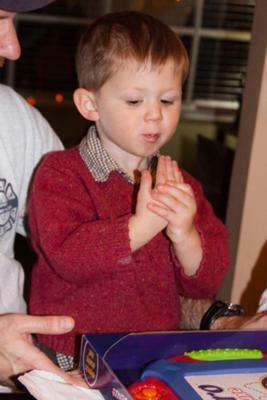 Telling MeMaw & Aunt Sean thank you for his birthday present in toddler sign language. The baby sign(s) that your sweetie is using in the photo: Thank You! Babies and Sign Editor says: Erin, thanks for such a great baby (toddler) sign language photo of Brayden signing, "Thank You"! Great job, Brayden! Send us photos any time you'd like to show us and other grateful parents! Comments for Baby Brayden Signing - Thank you for my birthday present! I can't wait to teach him more! Join in and write your own page! It's easy to do. How? Simply click here to return to Submit Photo Baby Sign!.